I saw a video over the internet of a woman painting a flower. It turned out beautiful. If she can do it, why can’t I? I went online and found a set of brushes and acrylic paint and ordered my very first paint set. Although, my flowers did not become as nice as the lady’s, I still managed to continue it. Painting was a new way for me to express what I felt. It took me about 5 days to complete my first painting of the Adirondacks. Mostly because the paint needed to dry. This isn’t my first painting. 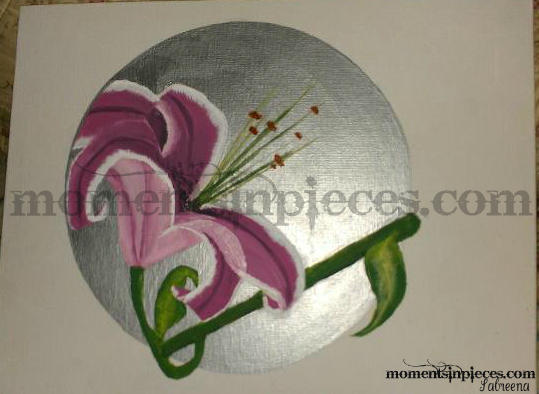 This painting of a Lily Flower, painted on April 7th, 2012, and in about 2 hours. It was a birthday present for my mom. Some edges still have flaws, but an image that comes from the heart is always flawless. This entry was posted on Thursday, August 16th, 2012 at 1:13 am	and is filed under Pictures, Rant. You can follow any responses to this entry through the RSS 2.0 feed. You can leave a response, or trackback from your own site.